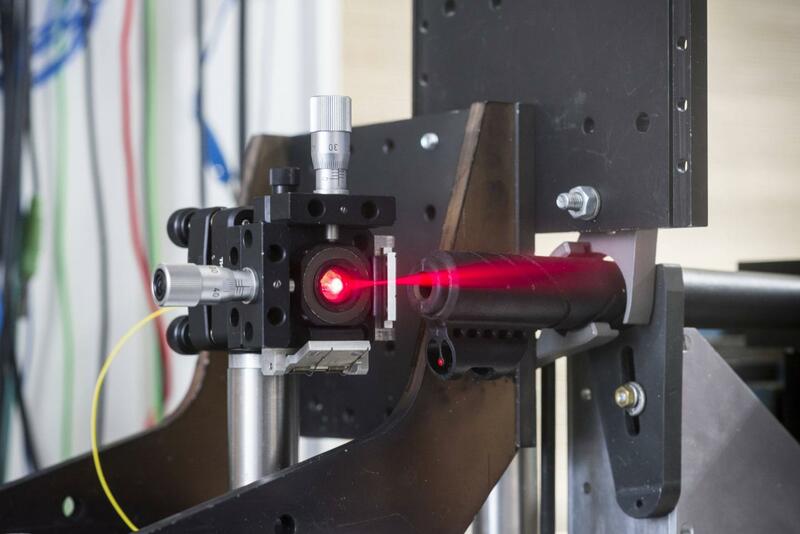 For decades, distance metrology by means of lasers, also known as LIDAR (laser-based light detection and ranging), has been an established method. Today, optical distance measurement methods are being applied in a wide variety of emerging applications, such as navigation of autonomous objects, e.g. drones or satellites, or process control in smart factories. These applications are associated with very stringent requirements regarding measurement speed and accuracy, as well as size of the optical distance measurement systems. A team of researchers headed by Professor Christian Koos at KIT's Institute of Photonics and Quantum Electronics (IPQ) together with the team of Professor Tobias Kippenberg at École polytechnique fédérale de Lausanne (EPFL) has started to address this challenge in a joint activity, aiming at a concept for ultra-fast and highly precise LIDAR system that shall fit into a matchbox one day. The basics of this concept have now been published in the scientific journal Science. To demonstrate the viability of their approach, the scientists used a gun bullet flying at a speed of 150 m/s. "We managed to sample the surface structure of the projectile on-the-fly, achieving micrometer accuracy", Professor Koos comments, "To this end, we recorded 100 million distance values per second, corresponding to the fastest distance measurement so far demonstrated." This demonstration was enabled by a new type of chip-scale light source developed at EPFL, generating optical frequency combs. The combs are generated in optical microresonators, tiny circular structures, which are fed by continuous-wave light from a laser source. Mediated by nonlinear optical processes, the laser light is converted into stable optical pulses – dissipative Kerr solitons – forming regular a pulse train that features a broadband optical spectrum. The concept crucially relies on high-quality silicon nitride microresonsators with ultra-low losses, which were produced at EPFL's Centre of MicroNanotechnology (CMi). "We have developed low-loss optical resonators, in which extremely high optical intensities can be generated – a prerequisite for soliton frequency combs," says Professor Tobias Kippenberg of EPFL, "These so-called Kerr frequency combs have rapidly found their way into new applications over the previous years. " In their demonstrations, the researchers combined findings from different areas. "In the past years, we have extensively studied methods for ultra-fast communications using chip-scale frequency comb sources," Christian Koos of KIT explains. "We now transfer these results to another research area – optical distance measurements." In 2017, the two teams already published a joint article in Nature, reporting on the potential of chip-scale soliton comb sources in optical telecommunications. In principle, optical frequency combs consist of light with a multitude of precisely defined wavelengths – the optical spectrum then resembles the teeth of a comb. If the structure of such a comb is known, the inference pattern resulting from superposition of a second frequency comb can be used to determine the distance traveled by the light. The more broadband the frequency combs, the higher is the measurement accuracy. In their experiments, the researchers used two optical microchips to generate a pair of nearly identical frequency combs. The scientists consider their experiment to be a first demonstration of the measurement technique. Although the demonstrated combination of precision and speed in the ranging experiment is an important milestone in itself, the researchers aim at carrying the work further and at eliminating the remaining obstacles towards technical application. For instance, the range of the method is still limited to typical distances of less than 1 m. Moreover, today's standard processors do not permit real-time evaluation of the large amount of data generated by the measurement. Future activities will focus on a compact design, enabling highly precise ranging while fitting into the volume of a matchbox. The silicon-nitride microresonators are already commercially available by EPFL's spinoff LiGENTEC SA that has specialized on fabrication of silicon nitride-based photonic integrated circuits (PIC). The envisaged sensors might serve a wide variety of applications, e.g., for high-throughput in-line control of high-precision mechanical parts in digital factories, replacing state-of-the-art inspection of a small subset of samples by laborious distance metrology. Moreover, the LIDAR concept might pave the path towards high-performance 3D cameras in microchip format, which may find widespread applications in autonomous navigation.